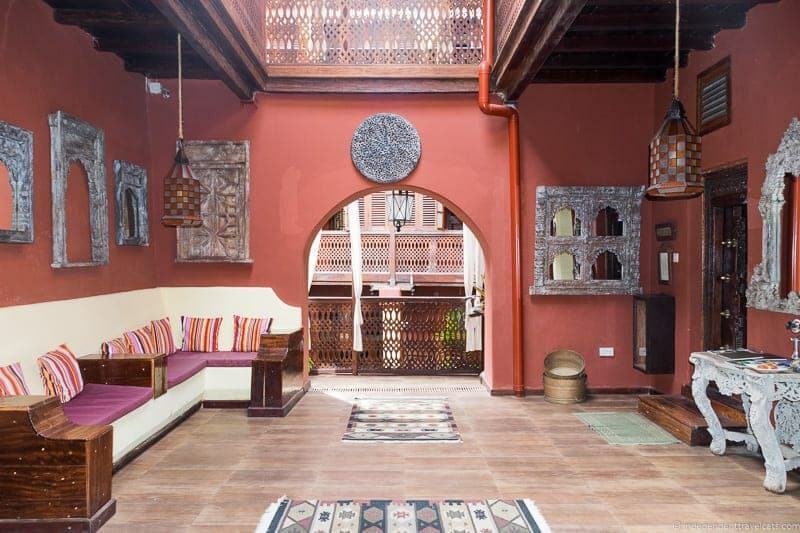 Jafferji House and Spa is a luxury boutique hotel located in the heart of Stone Town on the exotic spice island of Zanzibar. 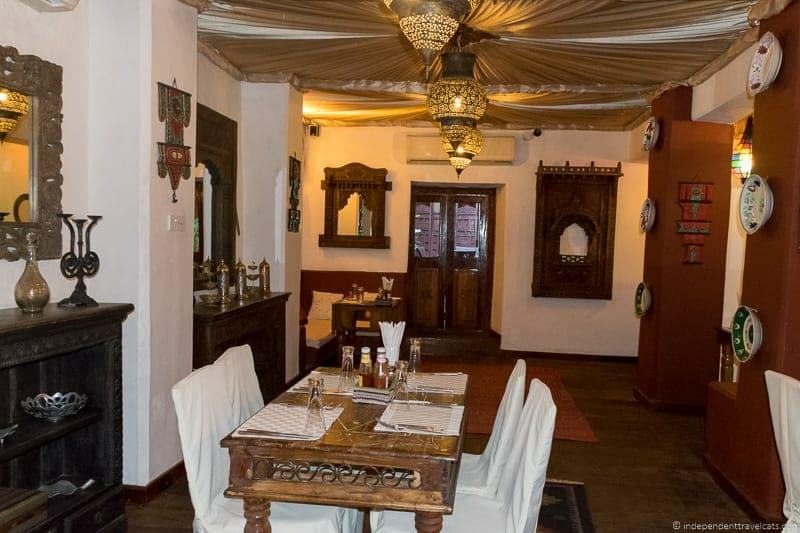 The building was built about 100 years ago and had been used as both a family home and a shop before being converted into a hotel by the Jafferji family. 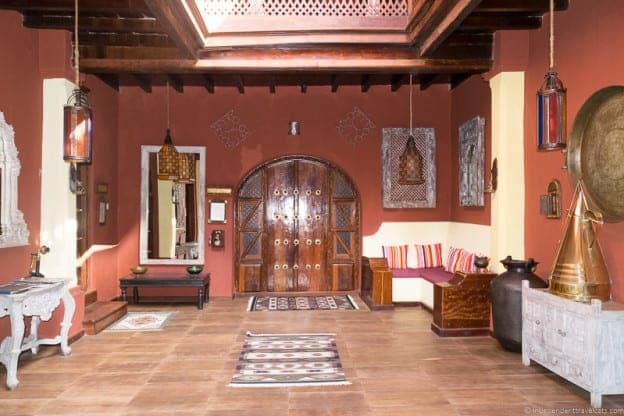 Opened in 2012, the 10-room boutique hotel is finely decorated with authentic furniture, doors, and antiques from around the Indian Ocean so that you can imagine you are stepping into the historical home of a sultan or wealthy spice merchant. 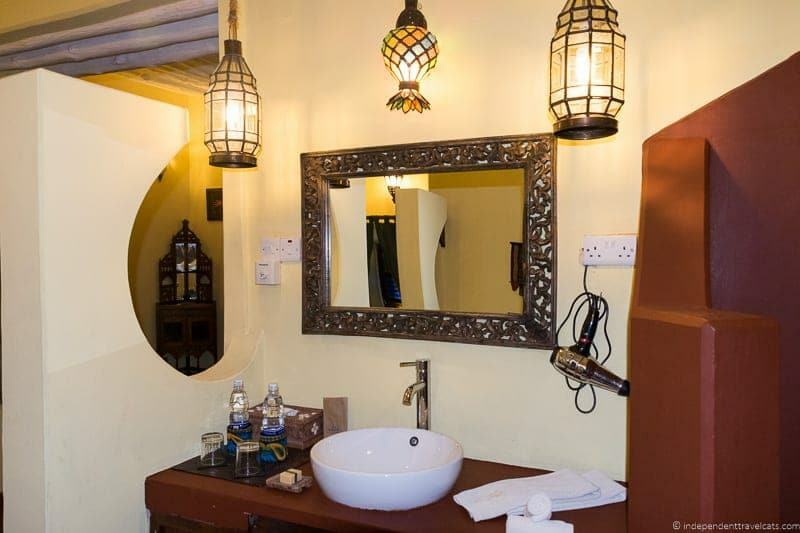 In addition to 10 spacious suites, the hotel offers richly decorated common rooms, an on-site full-service restaurant serving Swahili style food, and an on-site rooftop spa. 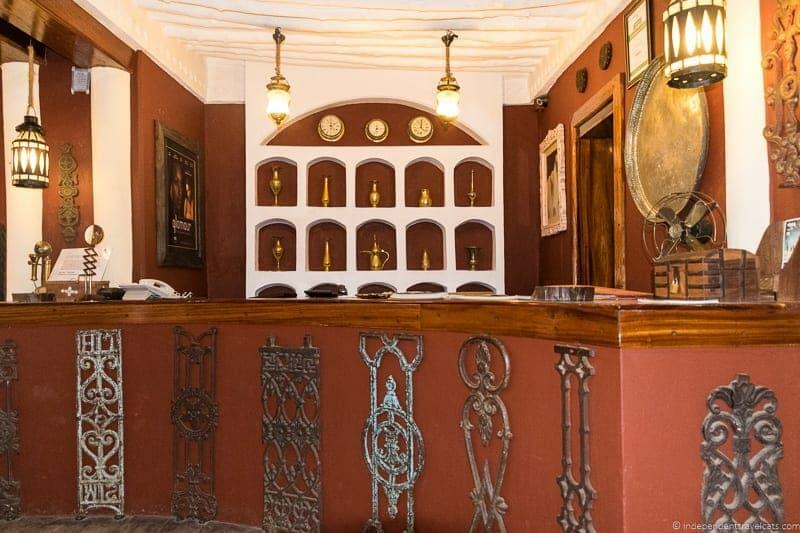 This hotel has quickly become a very popular choice among Zanzibar travelers with its fine furnishings, good restaurant, and convenient location in central Stone Town. 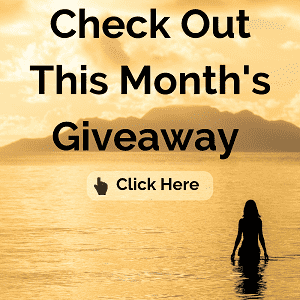 We’ll share all the details you’ll need to decide if you want to book this hotel and our own experience spending a night at Jafferji House and Spa. Getting here: The hotel is located within a 15-20 minute drive from the Zanzibar International Airport. You can arrange for a driver at the airport or a car or shuttle should be provided if you are using a tour company. The hotel can also organize transfers to and from the airport or to other locations within Zanzibar. 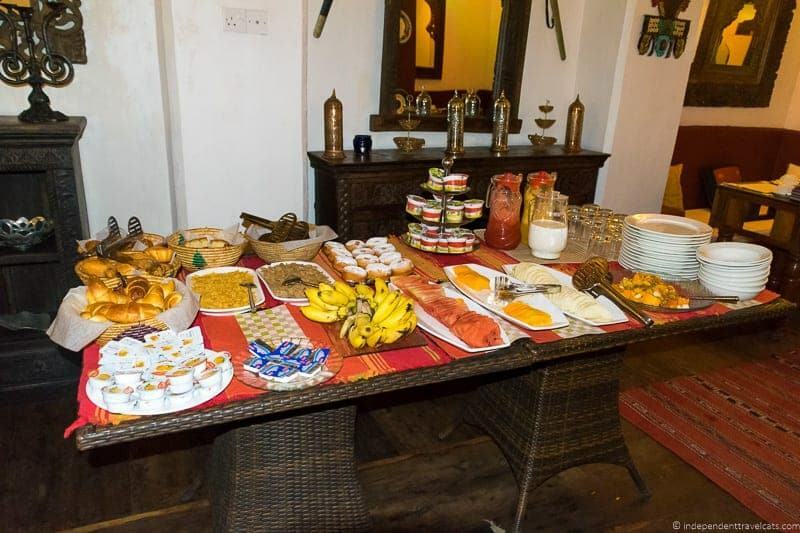 The hotel is located within a 10 minute walk of almost all popular Stone Town attractions. Room Pricing: A room for one person currently starts at $158.00 and double occupancy starts at $225.00. Rooms rates are lowest for the 5 Signature suites and increase for the 3 Superior suites, and the 2 Superior Deluxe suites. Children age 2 and under stay for free if sharing a bed with adults. Booking: You can book online at their website or by calling their reservations phone number: +255 712 328 586. 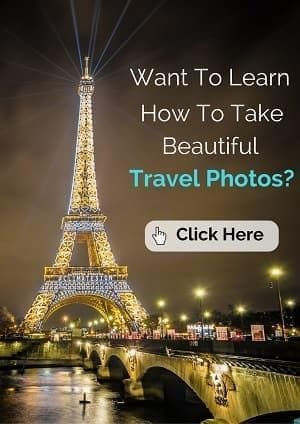 I saw the lowest rates on Booking.com so you may want to check them out for pricing and compare with the hotel website pricing. Arranging Transfers and Tours: While most attractions in Stone Town are within walking distance of the hotel, you’ll need to figure out transportation if you want to explore other parts of the island and to get to and from the airport. There are a number of companies that can arrange tours and transfers in Zanzibar and this can be done before your trip or it is quite easy to arrange them once on the island. Most hotels can also arrange these for you although admittedly not always at the lowest prices so best to ask around if you can. Our trip to Kenya and Tanzania was expertly handled through the local Tanzanian safari operator Amani Afrika. They recommended and arranged for Emrans Tours (email: info@emrans-tours.com phone: +255-777-097-391) to be our local ground handler and host during our time in Zanzibar, arranging all of our transfers and providing a guide for our walking and driving tours around the island. 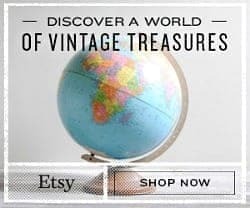 We had great experiences with both of these companies and highly recommend them both. We were met by a driver from Emrans Tours at the airport and transferred to Jafferji House in Stone Town. One of the first things you notice once you step into the hotel is all the ornate wooden details and local objects and decorations found around the lobby. You definitely would not mistake the lobby for that of a London hotel! We immediately started to notice the charms of this boutique hotel. Jafferji House is full of nooks and crannies with seating areas here and there and a seemingly never-ending staircase. It is a fun place to explore and if you stay here, I definitely recommend wandering around and checking out the artwork and furniture scattered around the place. Just outside our suites there were several benches that provided a great place to plan our day and the family staying next to us used the area to play a game of cards that evening. There is also a small library area just past the lobby that is a good space to read or have a chat with your travel companions. But perhaps one spot not to be missed is a journey to the top of the steps to the rooftop spa. 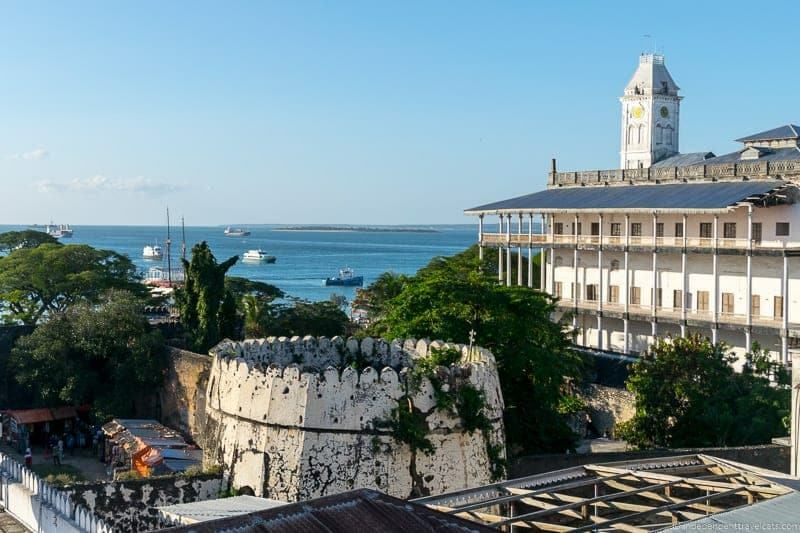 Just keep going until you reach the roof to enjoy the lovely views over Stone Town, which include portions of the Old Fort, Forodhani Gardens, The House of Wonders, temples, and the Indian Ocean. Jafferji House offers 10 spacious suites, and we stayed in one of the Signature Suites which is one of the least expensive rooms. Each room has its own name and we were specifically in the Zanzibar Kabisa. Outside each suite is a placard that provides some information about the name and the room. Ours said that Zanzibar Kabisa means “completely Zanzibar” and read: “This spacious suite is beautifully decorated in true Zanzibarian style. The colors and the furnishings, together with the intricately carved bed and handcrafted lovers couch give you a feeling of sultan royalty with ultimate luxury and comfort.” This is a great description for this spacious room that was richly decorated, full of carved wooden furniture and a muted red bathroom with a nice Moroccan style bathtub. Among the many in-room amenities, you’ll find a flat screen TV, a telephone, a flush toilet, digitally controlled air conditioning, signature toiletries, a safe, a hair dryer, an umbrella, and a set of bathrobes and bedroom slippers. Even though electricity outages are fairly common on the island, the hotel has a large generator that can be used during outages. We also found a plate of fruit waiting for us on the desk which we ate later as a snack and made a cup of the provided tea. 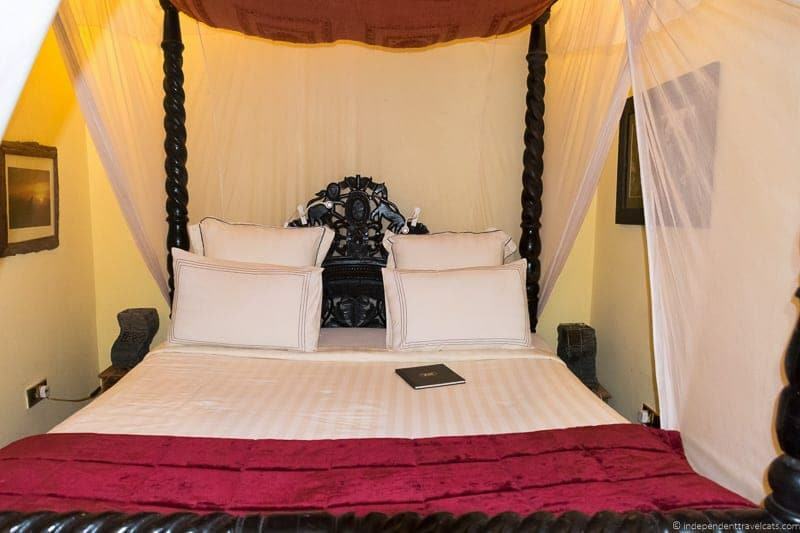 Lying on the four-poster curtained bed, we also found a small care package with a book of photographs of Zanzibar and discount vouchers to local businesses and attractions. The hotel also offers complimentary wireless Internet in all of the rooms which is a must-have for a travel blogger! Jafferji House has a full-service restaurant on-site called The Mistress of Spice Lounge and a rooftop spa called Window to Africa Spa. The hotel restaurant specializes in local Swahili cuisine peppered with plenty of the local spices. The restaurant smelled good and looked popular, but since we only had one evening in Stone Town, we opted to eat dinner al fresco while exploring the Forodhani gardens which hosts a large collection of local vendors in the evening selling Zanzibarian street foods. Breakfast was served in The Mistress of Spice Lounge and it was a very filling breakfast with good service, providing both cold breakfast buffet options and hot made-to-order options. If you are looking for either romantic private dining or intimate dining for a group, ask about booking the rooftop terrace for dinner. 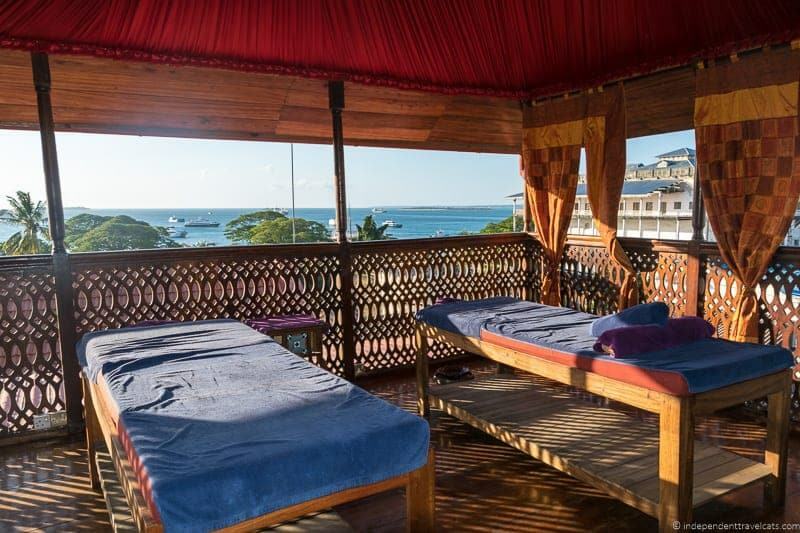 We didn’t try the Window to Africa Spa but we did venture up to the rooftop to take a look and its worth a look just for the scenery over Stone Town. The spa offers a variety of spa and massage treatments that can be easily arranged through the reception desk. We would have loved to spend more than one night at this family-owned and run boutique hotel as it was spacious, comfortable, and richly decorated. Perhaps best of all, it was also centrally located allowing us to easily walk to all the major tourist destinations in Stone Town within 10 minutes or less. We also loved just wandering around Jafferji House and enjoyed the great views of the city. We didn’t have a lot of interaction with the staff and no issues arose during our stay, but the staff were easy to locate and were friendly when we did interact with them. Even though we stayed in the lowest category room offered at Jafferji House, it was very spacious, richly decorated, and filled with all the amenities we could have wanted. Despite being a boutique hotel with only ten suites, it offers a full-service restaurant and a rooftop spa which is a great combination of being small and intimate while providing all the services that guest may want during their stay. 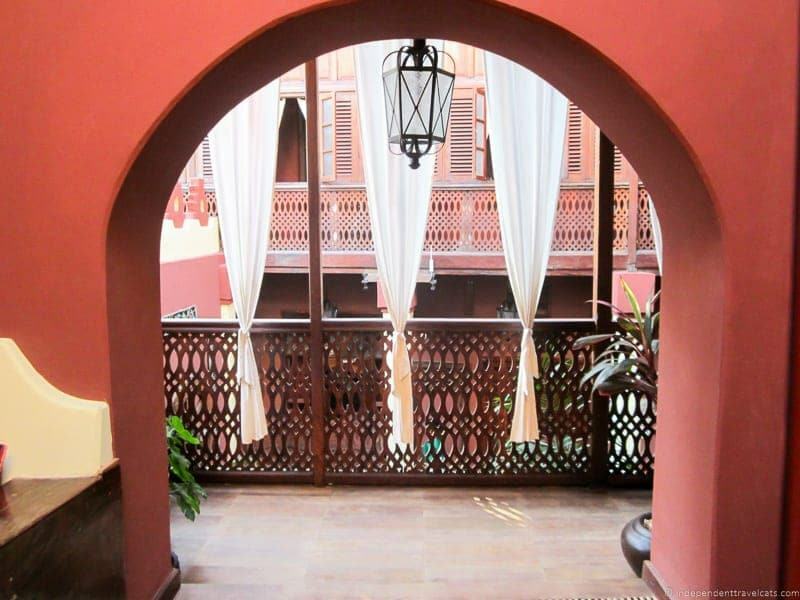 A great place to consider if you are looking for an authentic and centrally located lodging option in Stone Town. Is the exotic island of Zanzibar on your future travel list? 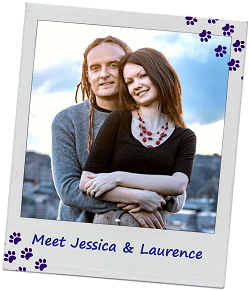 Have tips or advice from a recent visit, or questions or comments about our stay? As always, we welcome any questions or comments! Wow! What unique decor. It’s so colorful! 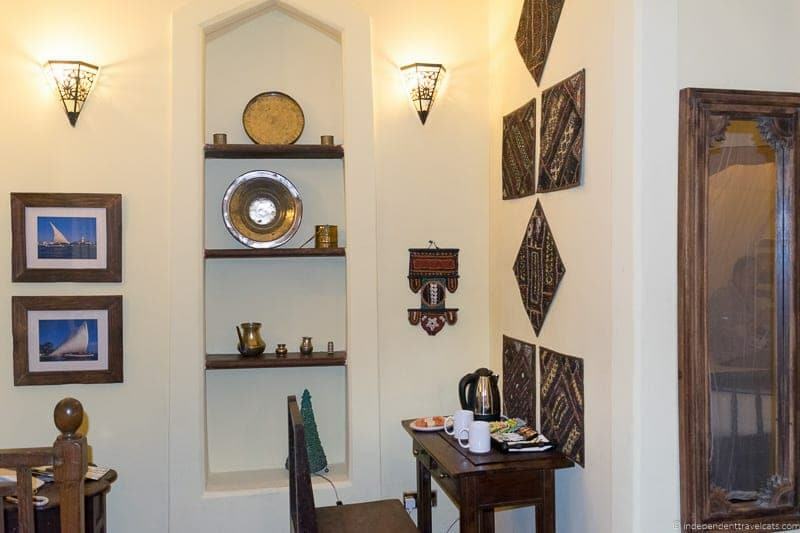 It looks like you had a great one-night-stay in Stone Town! 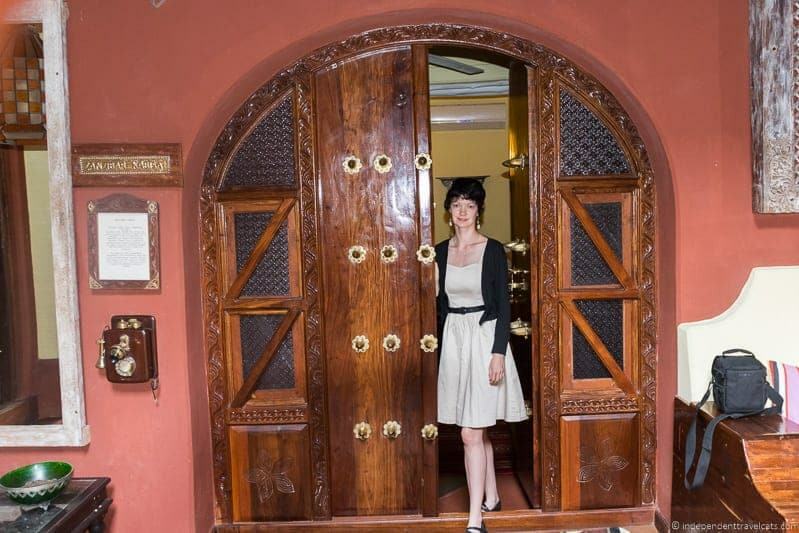 Hey Jessica, This is an awesome hotel in Zanzibar. 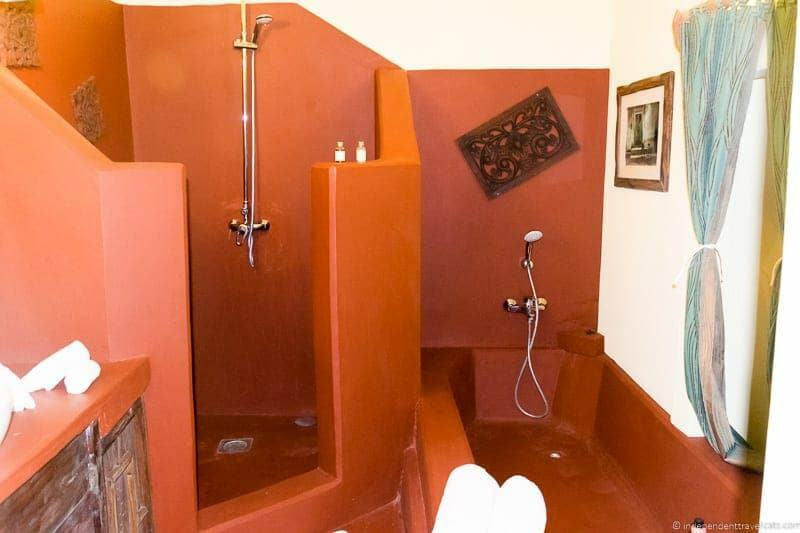 Each of the hotels you wrote about in East Africa seems unique and exclusive. And love the romantic theme of this one. They all offer a perfect blend of old-fashioned comfort with modern amenities. Thanks a ton for this great review! It seems we missed each other as I was there not that long ago as well – it’s such a beautiful place! I love the simplicity and furniture pieces puts perfectly on the right places! I also love the color of the paint they use on the walls. 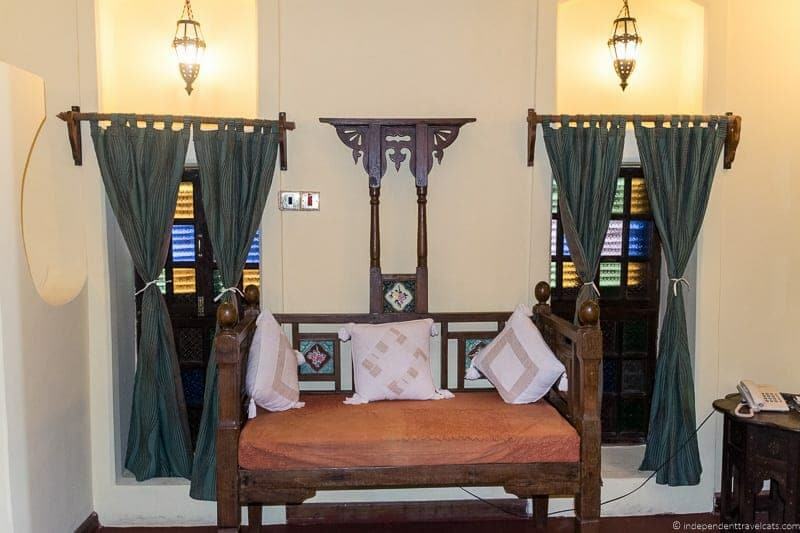 Yes, I think that travelers really like Jafferji House for the great decor and stylish rooms. 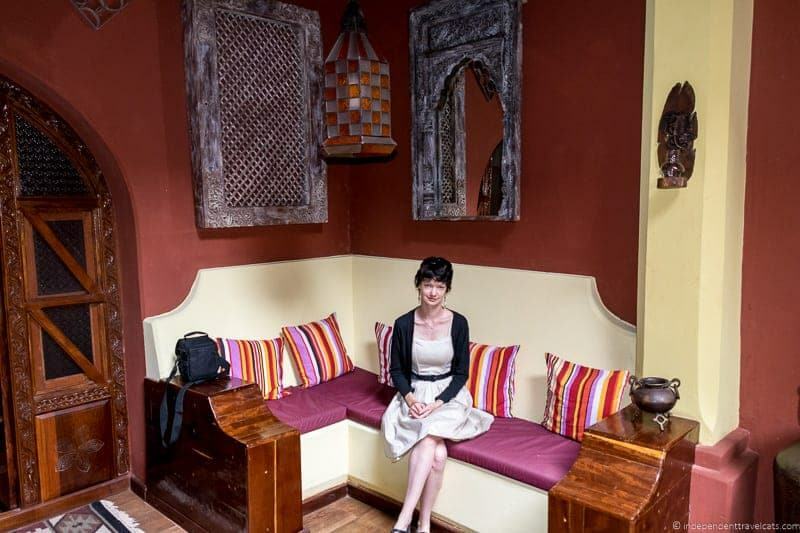 It is a great place to stay if you are wanting to feel you are living in the home of a rich merchant or sultan from 100 years ago! I have to admit that I had to check online to even see where Zanzibar is! I love this hotel… I would definitely know I was “away” with all the interesting decor, but as I was looking at the food on the table, I thought, “Most people really eat similar things all over the world.” The view from the spa – amazing… what a treat! What a beautiful place to stay! The massage beds are in the perfect place. That view would relax anybody. The place looks a little bit like a Moroccan ryad. Hi Ruth, yes an open rooftop is a perfect place for a spa and massage tables! 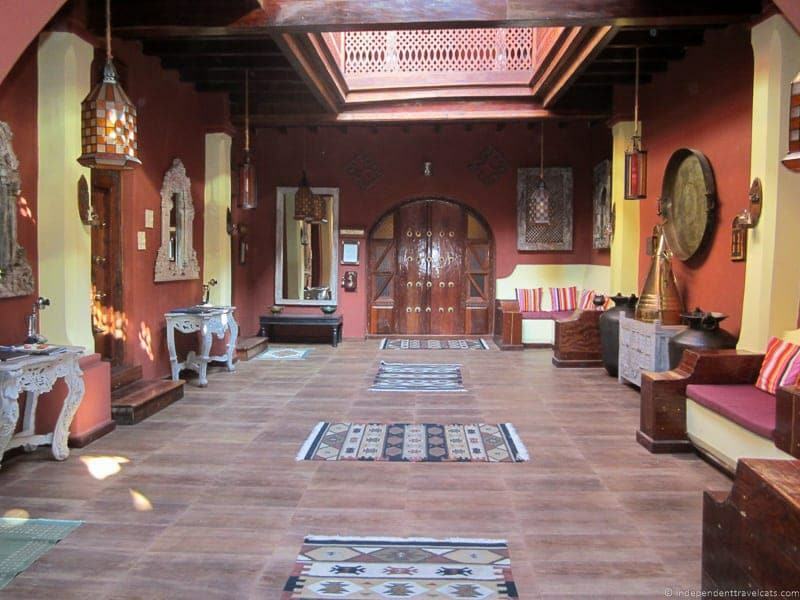 I have not been to Morocco yet, but Zanzibar was visited by travelers and merchants from around the Indian Ocean as Zanzibar was a major trading area so some of the influence for the Moroccan riad and homes in Zanzibar may have come from the same place. Ah, Zanzibar! A name with exotic resonance and mysterious atmosphere. I love the suite that you stayed in. Everything seems comfortable and I bet there was a lot to explore in Stone Town. I’d love to visit it someday. Stone Town is an interesting place with lots of history, some good and some bad (slavery). The rest of the island offers some nice beaches, small villages, and great resort getaways. Beautiful accommodations. I can already hear those massage tables calling to me. It looks like they have taken a lot of time to get the details perfect. It was a really nice place to stay in Stone Town, a perfect size for us and fun place to explore:) Unfortunately, we didn’t get a massage but enjoyed the great views from the rooftop anyway!